Plex Media Server is a pretty cool product for storing and watching your videos, movies, or listening to music on any device mobile or desktop. If you have read or used my other article for Installing Plex Media Server then at some point in the Plex Browser or application you will come across the notification saying that Plex Media Server has an upgrade available. Unfortunately if your Plex Media Server is on Linux this is not possible to do using the application, so it needs a teeny bit of command line code to make it happen. So here is my simple step by step guide for how to do upgrade Plex Media Server. 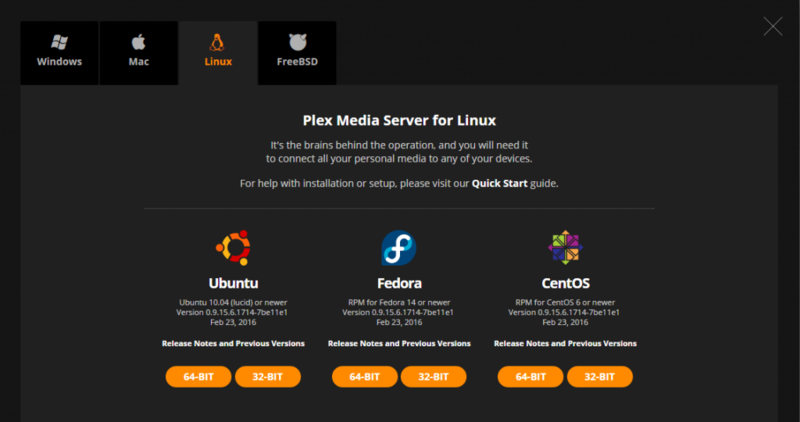 1) First you need to download the new version of Plex Media Server. You can get that from https://plex.tv/downloads. Obviously the above url will change with each release so just paste what you copied from the website in. If that doesnt work for you then have a check in /etc/init.d there is normally an init script there you can use to stop and start the service. semodule: SELinux policy is not managed or store cannot be accessed. Do not worry, on my server I have selinux disabled so think it is related to that. It really doesnt matter and doesnt affect the running of Plex Media Server. You should then be able to log back in on your browser and the update message for Plex should have gone.